The August Jobs Report had its positive and its negative aspects. On the positive side, 169,000 jobs were added to the American economy in August. That means that those 169,000 Americans are no longer unemployed. The benefits of the hiring for the employees, as well as the employers, cannot be denied. Moreover, increases in hiring will likely bring more revenue to the government in the form of payroll taxes, as well as stimulate economic activity. On the other hand, unfortunately, the creation of 169,000 jobs may not be enough to keep up with population growth. It is estimated that the economy needs to create 180,000 jobs to keep up with our growing population. In order to grow beyond that, we really need to be creating 200,000 – 300,000 jobs per month or more. Ideally, the more the better, of course. Reagan’s recovery led to an average of over 340,000 jobs per month with a smaller labor force than today. Nate Silver points out that if the Reagan Recovery translated to today’s participation rate, the recovery would mean that 487,000 jobs per month would be created. Now that’s a recovery. Even if 169,000 jobs exceeds population growth, we really need to be creating 100,000 more jobs per month than we need to keep up with a growing population so that we can recover the millions of jobs lost in the Great Recession. We are not doing that now. Unfortunately, most of the monthly non-farm payroll data has been much less than 300,000. In fact, other than May 2010 — which was a clear outlier with over 500,000 jobs created (mostly census workers) sandwiched between two months of job losses — there have only been three instances that monthly nonfarm payrolls have exceeded 300,000: April 2011, January 2012, and February 2013. One of the more recent data aggregation tools that has been released by the Federal Reserve is called the “Federal Reserve Economic Data” or “FRED.” It really is an amazing device that lets people examine data relating to money supply, unemployment, and other data points tracked by the Fed. Depending on what data you look at, you can draw different conclusions. Shocking, I know. From this chart, it looks like we are very close to getting back to the total number of jobs that the US had right before the Great Recession, right? Well, maybe not that close. Still, one could argue that we are almost back to where we were before the recession, right? Unfortunately, no. This is because the total number of jobs does not take into consideration the growing size of the population. As I mentioned above, we need somewhere around 180,000 jobs per month to keep up with population growth. I have seen lower numbers than that (such as 125,000 per month), but figure that at the bare minimum the first 100,000 jobs created per month simply offset the number of people entering the workforce because they have immigrated to the United States, they graduated from school, or they turned 18 and entered the workforce. Houston, we have a problem. If we really have seen the Labor Force Participation Rate “bubble” burst, America is in store for a major amount of economic hurt. The Labor Force Participation Rate is the percentage of the civilian population of the United States that is employed (self-explanatory) or unemployed (meaning someone who does not have a job, but is actively searching for a job). The lower the Labor Force Participation Rate, the more people have essentially “given up” for looking for work. That’s a major problem on several grounds. If people have given up looking for work, there is a strong likelihood that they are being supported by the state through welfare programs, rather than private charity or family members. Despite the fact that I am an non-empathetic a-hole, I certainly am not advocating that we eliminate the social safety net for the less fortunate. The problem as I see it is that this Administration has permitted the relaxing of requirements to receive such assistance. Does this not encourage dependency? I think that it must. However, the ending of “Workfare” as we know it does not explain this decrease of the Labor Force Participation Rate going back for over a decade, since the relaxing of the “Workfare” rules began in 2012. 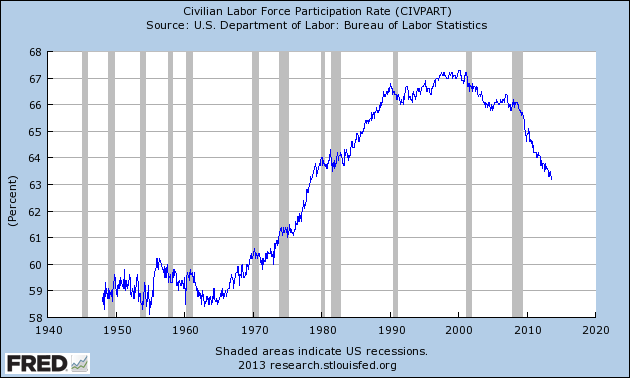 So what could be the cause of the precipitous drop in the Labor Force Participation Rate? Both the Obama and Bush Administrations passed rules and regulations on business which are costly. This blurb by CBS suggests that while Bush enacted more regulations by a small margin, the Obama Administration’s regulations on business have been more costly. Regardless, regulations which costs hundreds of millions of dollars per year only help to constrain private sector job growth. The biggest regulation and job killer passed to date, of course, is Obamacare. It is estimated that over $31 billion has been spent in an effort to ensure compliance with Obamacare over three years. How many private sector jobs could have been created with $31 billion? That’s just one regulation. This Reason piece argues that regulatory costs, compounded over decades, has cost Americans trillions — and made us all 75% poorer. That’s not a typo. Rather than forcing business to waste money on compliance with Obamacare, needless regulations, an increasingly complex Byzantine tax code, why can’t we streamline rules and let businesses do what they need to do to expand and hire more Americans? The decrease in the number of tax payers is a major problem, no matter your political persuasion. Many left-leaning economics folks have argued that a decrease in the number of tax payers is primarily what leads to higher deficits because of the decrease in federal revenue. To some degree, this is an accurate statement. Of course, the secret to increasing tax revenue is not to increase rates, but to grow economic activity — which creates more tax payers and thus, more revenue. We need more tax payers, more people with jobs, and more economic activity in order to reverse the decade of decreasing Labor Force Participation. A good place to start is by eliminating needless regulations being imposed on businesses. The positive impact on business growth, hiring, economic activity, and (yes, I know) tax revenue will be a boon to the economy that we desperately need. This week, we have more jobs data being released on Tuesday morning, relating to job openings in July 2013, which will give us a more in-depth picture of the labor market. Retail sales data will be released on Tuesday and Friday. Initial claims will be reported on Thursday, with a consensus number of 330,000 new initial claims. Also look for the producer price index, as well as consumer sentiment data on Friday.